Just after the conclusion of the French and Indian War, the Parliament of Great Britain passed a series of policies intended to reshape the workings of its American empire, including the Stamp Act of 1765. Although royal officials attempted to divide Bostonians along class lines, the town stood unified. Professor Benjamin L. Carp of Brooklyn College, CUNY, will illuminate Boston’s waterfront community, describe the actions of its radical coalition, and explain why Revere and his compatriots were so successful. The Stamp Act Crisis--What difference did it make? What were the long-term consequences of the crisis? Professor Robert Allison of Suffolk University will describe how this episode is important for what happened--a broad mobilization of Bostonians, who demolished property and forced the resignation of Crown officials--for how the British government reacted--by rescinding the Stamp Act--and for the way Bostonians would remember these events. “The Lowest of the Mob”: Exploring the Actions of Sailors and Slaves during the Stamp Act Crisis. In the late fall of 1765, colonists wearing “soot, sailors habits and slouch hats” harassed Crown officials, tore down houses of prominent merchants, and violently hounded those suspected of involvement with the “damned stampt paper.” Molly Fitzgerald Perry, Lecturer at Christopher Newport University, will analyze the descriptions of Jack Tar sailors alongside those of free and enslaved people of color, recreating the central role played by mariners and African Americans during this moment of imperial disruption. Image Credit:"O! 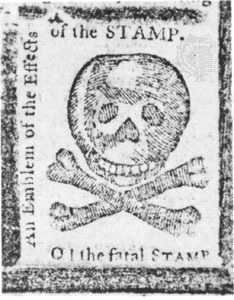 the fatal Stamp" by Pennsylvania Journal - Rare Books and Manuscripts Division, The New York Public Library, Astor, Lenox and Tilden Foundations. Licensed under Public Domain via Commons.